Most of the time video game enthusiasts are so busy trying to get to that next level-- or in my day-- get to the end of Donkey Kong or Pac-Man that they don't stop to realize the music that seeps into their subconscious as they push the buttons. Yet it's retained there as the theme from the Pac-Man series, Super Mario Brothers, and Sonic the Hedgehog when heard again instantly transports you back to hours wasted at the arcade or in front of your television risking the prospect of getting "video game thumb," long before text messaging injuries or too much Guitar Hero were even in our vocabulary. While the music just seemed to magically fit the game as yet another integral part of the experience-- much like the right graphics or right characters-- it wasn't until I was presented with the opportunity to review a video game soundtrack that I realized the amount of artistry and hard work that's involved. Much like a cinematic score-- composers work with images to create an entire fitting audio experience but unlike most films that are presented with dialogue or special effects, creating a video game soundtrack in reality seems as daunting as the task set to those who work in the sound design departments on animated movie. As four-time Game Audio Network Guild award winning composer Winifred Phillips noted in the SimAnimals press release, "working on a brand new game allows me to have creative control over the sound from the start with nothing to compare it to, which is invigorating and quite an honor." In a world where female composers are rare, it's an even rarer experience to find one working in the male dominated industry of video games yet Phillips has been an increasingly popular and accomplished artist-- bringing imaginative arrangements to games that-- in the case of SimAnimals at times infuses the natural world sounds of birds with some dissonant jazz backed by electronic instruments, mellifluous classically laced melodies and more which makes her work all the more intriguing when analyzed away from the visual overwhelm of a game. Recently garnering a Hollywood Music Award nomination for Speed Racer: The Videogame, Phillips-- who has also been dubbed a "goddess of music" by Cinescape Magazine-- has scored such video games as God of War, Shrek the Third, The Da Vinci Code, and Charlie and the Chocolate Factory. 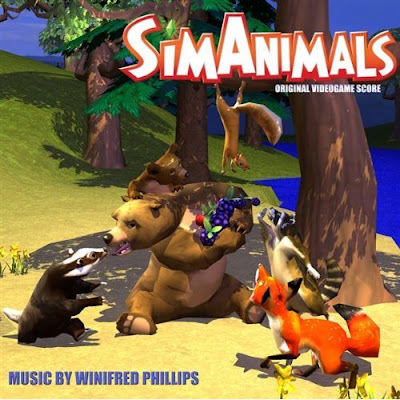 And sure enough the industry has taken note as Phillips was tapped to contribute to the newest entry in the wildly successful Sims label franchise by Audio Director Robi Kauker who stated the goal for SimAnimals was ultimately "to give a unique and sophisticated voice to the game" that found original source "inspiration from pieces like Prokofiev's Peter and The Wolf." In the accompanying music, Phillips changes tone and styles effortlessly throughout a soundtrack that's additionally been made available as a digital download from both iTunes and Amazon, among other retailers. As "each location starts off with a unique score, from strains of Celtic music for ancient castle ruins to the funky groove of the old junkyard," Phillips' richly inviting music lures you from the opening "SimAnimals Theme." Blending together woodwinds and strings to create a naturalistic yet classy introduction, the theme-- which is referenced throughout-- changes over the course of the roughly thirty six minute album that's designed to change with "the mood of the game," as players can hear the way their "choices are affecting the forest through the music, whether that be upbeat and light when the forest is happy or dramatic and dark," when the opposite is true as SimAnimals Executive Producer Sam Player indicated in the press release. In the follow up second track "Trailhead," uplifting melodies are blended with the sounds of nature and birds as the music sort of fades from its complex start and emphasizes instead the ambiance of the game's setting before "Free Play" engages listeners in a lovely musical dance. This becomes far more serious with the more urgent "World in Need," that layers the strings with a driving force underneath striving for gamers to succeed through the more perilous sounding "Dry Gulch." In the highly original "Castle Ridge" that transposes both the sides of the journey and pleasant and unpleasant possibilities by also imbuing it with a "royal" undertone, we're enchanted by the inviting blend that makes the title of the subsequent "Friendship" seem all the more fitting. Especially given that-- over the course of the album-- we're constantly reminded that as easy as it is to move through the forest, missteps and danger lies just around the corner if one isn't careful. Moreover, finding the right balance between the two makes it a friendlier prospect all around in the track's call and answer approach near the end that matches some rich usages of strings with woodwinds. The appropriately titled "Hard Times," begins slightly ominously. And then roughly forty seconds in it recalls something straight out of the mind of Tim Burton and collaborator Danny Elfman with its fittingly Halloween-like sounds of unpredictable orchestral styled fusion jazz where nothing seems to go together easily with various earlier motifs utilized amidst dissonance as you imagine gamers trying to redirect their energies to get to the follow-up titular "Happy Place." Recalling some of the earlier strains used in the theme but played at a faster pace-- "Happy Place" seems like it could double as theme music for a character and a whimsical smile inducing string heavy "Orchard Playground" that lightens things up with the rhythmic plucking of strings before the theme returns once again is in stark contrast to the ominous foreboding sounds of an orchestra in disarray in "Danger Woods." Using more natural sounds of water rushing at the start of "Foggy Wallow," Phillips continues on painting great musical pictures as we hear the sounds of the water mixed in with the electronic rhythms of her score, making the album's release as a solo work seem all the more justified throughout as certain songs like the next tracks "Absolutely Positive," and mini-ballet styled "Woodlands" played together would work great as a nice background music to relax to, help clear your mind when you drive, or appreciate while doing some light reading. As the last few tracks play-- alternating between the inspired classical rhythms and quirky use of solo instruments put together in an upbeat manner-- you can practically envision moving closer towards the ultimate goal of finishing the game which culminates in my favorite and the most addictive number. More specifically it's the final end credits work "Forest Song" that delivers on a superior level touching on the strengths served up earlier in the album by crafting one catchy all-encompassing theme. It's confident, multi-layered, and definitely worthy of an immediate download for those even the slightest bit curious about the artistry involved in composing for video games as it fades out naturally with the sound of birds. A worthwhile and engaging listen that makes you appreciate the art of composing on a new level-- Phillips' impressive work is quite eye-opening and feels fresh throughout since-- as opposed to having to underplay scenes in films where an action or line of dialogue steals the moment, the musical contribution to the game can make or break the experience by taking the visuals of the work and expanding them into a completely engrossing experience for the player. It would be a fascinating experiment to try and utilize some of the video game composition techniques to film compositions and see if it would re-invigorate some of Hollywood's typical go-to composers to try and think outside the box and give filmgoers a new range of music to hear from those working in the arena of games. Yet luckily for those who take the opportunity to try something different such as this reviewer who can barely play Tetris to stop for a moment and analyze a soundtrack for a game-- I think you'll find it's an unexpected experience for music lovers, gamers, and those who appreciate animation alike. Highly recommended-- SimAnimals from composer Winifred Phillips and producer Winnie Waldron is available now via iTunes, Amazon, and many others.